Latest news - Chocolate & wine? Looking for a great deal on a bottle of wine? We have a fantastic selection of red, white and rose wine, including dessert wines and champagne from wine merchants such as Tesco, M&S, Waitrose and Majestic. Select your preferences at the top or just enter a keyword for something more specific. England - Best Enjoyed: In a variety of ways; either on its own, over ice, or topped up with lemonade or soda for a refreshing, long drink. A distinctively rich and warming drink produced from the finest ginger. Ideal for mixing with whiskey for the classic Whisky Mac. England - Add slices of fruits and cinnamon sticks if required for visual effect. To warm, heat lightly in a saucepan or in the microwave in a suitable container for 45 seconds on high. Do not boil. A traditional Winter favourite, Winter Warmer Mulled Wine blends the finest ingredients to give a character of subtle cinnamon and clove spices and zesty citrus fruits. This Mulled Wine can be enjoyed cold, or warmed to bring out the fruity aromas and rich flavours. Chile - Luis Felipe Edwards bought his first vineyard, the 60-hectare Fundo San Jose estate in the Colchagua Valley, in 1976 and has since grown his winery into the largest family-owned winery in Chile, with vineyards throughout Colchagua, Maule and Leyda. Thoroughly citrussy on the nose, with fresh lime and lemon forming the aromatic backdrop. More citrus on the palate, accompanied by a riper hint of pineapple, and mouthwatering acidity. Partner with a herbaceous salad, or with all manner of fish and seafood. Italy - Antonio Carpene founded his winery in 1860, having been fascinated with Champagne. A qualified chemist, he was in contact with Pasteur and Koch and was firmly convinced that a similar wine could be produced in Italy. He applied his knowledge to the Prosecco grape (now known as Glera), the majestic variety of the Conegliano and Valdobbiadene zone. Over 130 years of history, embracing four generations of the family, testify to Carpene Malvolti's dedication to product quality and they are unquestionably one of the leading producers. 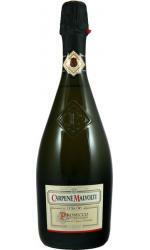 Fine and continuous bubbles, the wine is fruity and appealing with a floral and fresh fruit bouquet and a lemony finish. Every day serving suggestion: Ideal as an aperitif and excellent with fish dishes and throughout the meal. Other - A sweet rosé fruit fusion with natural fruit flavourings of Strawberry, Lemon and Basil. Serve chilled or over ice. Argentina - Bodegas Santa Ana was founded over 120 years ago by Luis Tirasso a native Italian. The torrontes grape variety is closely related to muscat and produces fresh aromatic wines reminicent of both muscat and gewurztraminer. This example of torrontes has all the classic flavours and aromas of the variety, white flowers, citrus and a hint of spice. The finish is crisp and balanced. This versatile wine can be enjoyed on its own as an aperitif, with seafood or with mildly spiced dishes. Other - A sweet white fruit fusion with natural flavourings of Elderflower and Green Apple. Serve chilled or over ice. Other - A carefully selected red wine blended with well-chosen and warming spices. Satisfying and not sweet, this is an excellent mulled wine. Argentina - Made from grapes grown on slopes in the Mendoza River Valley. The bunches are hand harvested before destemming and crushing. A natural malolactic fermentation is allowed to take place producing a wine with a soft mouth feel and a gentle character. Intense flavours of plum and cherry with gentle tannins make this a soft and fruity wine with a lengthy finish. A perfect match for grilled meat but works equally as well with all manner of pasta dishes. Other - Fresh, floral, pretty pink with soft aromatics and a summer fruit and creamy tropical palate. South Africa - With this Chardonnay, the winemakers set out to create a wine offering a combination of the respective benefits of oaked and unoaked interpretations of the variety, using cool fermentation in tank followed by only 7 months' lees ageing in barrel. Fresh lemon and peach fruit provide the backdrop, which is overlaid with gentle notes of toasted hazelnut and vanilla. Plenty of refreshing acidity and a creamy palate texture. Drink with pan-seared fish and steamed vegetables. Other - Whatever your occasion this popular Italian white will appeal to everyone. Its fresh and fruity and goes fantastically well with seafood, antipasti or salads. Other - This is a much loved classic white style from the Name region of Germany. The attractive ripe fruit is complemented by just a hint of sweetness. Best enjoyed well-chilled on its own or with spicy appetisers. Other - This fresh, easy-drinking white is named after is winemaker, Eva Keresztury. It's a fruity blend of Chenin Blanc, Pinot Grigio and local grape varetity Kiralyeanyka that represents excellent value for money. Other - A bright blush rosé with fresh strawberry and red fruit flavours. Crisp and medium sweet. Other - This is a fruity and easy-drinking red sourced and blended to an exclusive style by our buyer Nick Room. A great-value New World red wine with the earthy character and structural backbone associated with Chilean reds. Other - This is a full flavoured yet soft, succulent wine which is ideal with savoury dishes and cheese. It may also be drunk on its own. Spain - Although best known as the backbone of Rioja's rich, oak-matured reds, Tempranillo also excels when vinified using more modern methods that preserve its supple, naturally jammy fruit character, creating some brilliant value everyday wines such as this. Classic Tempranillo notes of dark cherry and blackcurrant are lifted by a hint of dried flowers and spice. Superbly balanced, the fruits of the forest flavours are perfectly complemented by soft tannins. Approachable and good value, to be drunk now with barbecues and steaks. Other - Beautiful citrus and peach notes are backed by a hint of almond. Excellent fruit intensity for the modest price; a great addition to the range. Ideal with pasta in a pesto sauce. Other - Soft pineapple fruit dominates this easy-drinking, delicious white. Unoaked, clean, bright and mouthwateringly refreshing, this is superb value for money. Would make an ideal apéritif. Other - This beautiful little white from South Africa is an absolutely amazing value wine. Fresh, crisp and zesty with a round texture it’s easy-drinking with citrus and apple fruit notes. Spain - Central Spain is one of the most diverse and prolific wine producing regions in Europe, and is the source of many great value wines such as this fruit-driven rose. A short maceration gives a light, delicate and easy-drinking style. An intense pink wine with plenty of juicy berry fruit. Strawberry and raspberry flavours are complemented by a creamy texture and crisp, refreshing acidity. A perfect summertime aperitif! Other - This delicious rosé is made by a collection of three of the most progresive cellars in the region. Dry, with an attractive strawberry character, this can be drunk on its own or with a variety of lighter dishes and tapas. Other - A vibrant red with ripe blackcurrant fruit flavours and a touch of spice on the finish. This is an exclusive blend put together by our own buyer. Other - Fresh, zippy and aromatic it has uplifting aromas of honeysuckle and lime is rich yet fresh on the palate and has a succulent finish. It’s a great match for grilled chicken, sushi or mildly spiced Asian dishes. Other - This velvety red is a soft blend of spicy Shiraz and succulent Grenache, with lovely peppery notes and juicy black fruit flavours. Other - An aromatic and citrussy French white that's crisp and refreshing. Ideal with salads, fish or seafood. plonk.co 2019. All rights reserved. plonk.co aims to provide a wide range of wines from all over the world, but cannot be held responsible for the accuracy of details provided. Sign up for the latest deals on wine. No spam. No junk. Just deals!